Set of two cast brass faux bamboo door handles. One left facing and one right facing. Faux bamboo handle is 4” wide. Each backplate is 6” tall x 2” wide x 2” deep Installation hardware not included. Overall unpolished patina. 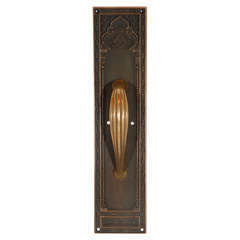 Can be re-plated in brass or nickel for an additional charge. overall unpolished brass patina, with visible aging, as shown. 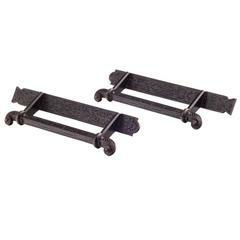 Pair of gilt metal faux bamboo wall brackets. Antique mirrored tops. Two back holes for hanging, hanging hardware not included. Pair of curvy bamboo-style metal armchairs newly painted in a custom blue finish. Newly upholstered in Quadrille Bonaparte leopard fabric. Pair of midcentury brass door handles geometric gold and black pattern design, 1970s, Germany.